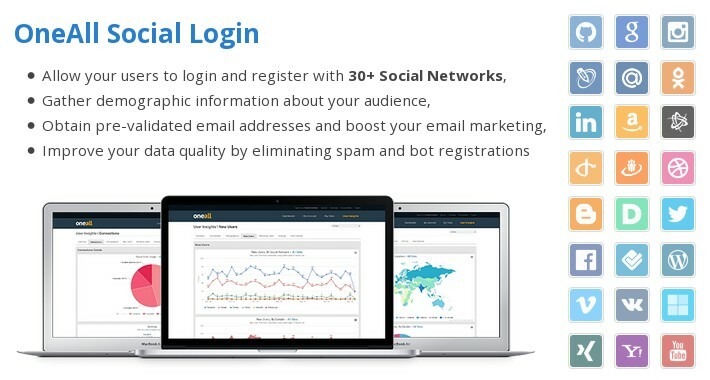 OneAll Social Login allows your users to connect with one click to your Simple Machines Forum by using their social network accounts. Over thirty different social networks such as Facebook, Twitter, LinkedIn, Google, Yahoo, GitHub, Windows Live and others supported. Users can connect with one click to your Simple Machines Forum by using their social network accounts. Social Login increases the user registration rate of your Simple Machines Forum by simplifying the registration process. Get rid of long forms and complicated captchas by allowing new users to sign-up with their existing social network account. Gather rich demographic information (age, gender, phone numbers ...) about your users without requiring them to fill out any forms. Obtain pre-validated email addresses to increase your data quality and eliminate the long and tedious email confirmation process. Your existing users can link their account to one or more social networks and can then use these social network accounts to login. Eliminate the issues of forgotten usernames and passwords! Social Login seamlessly integrates into your Simple Machines Forum so you and your users don't have to start from scratch. so you can be sure Social Login will always run smoothly and with the most up-to-date API calls. In order to connect with the OneAll API, you have to create a new account at https://app.oneall.com/. optimizing a site's connection with social networks. We are devoted to creating a positive experience for our customers and always try to go above and beyond your expectations. with the integration of the extension in your forum.